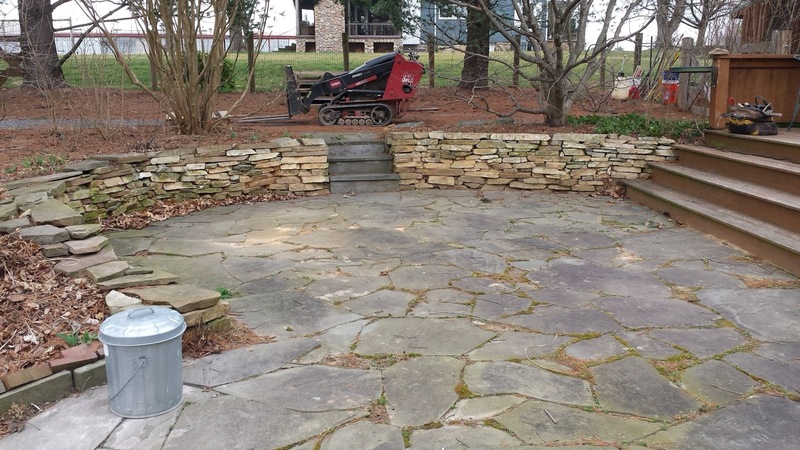 20 ft Long x 24"-28" High Butler Stone mixed with old Marriottsville Stone w/4 Blue stone steps. 3/8/2017 Wednesday was the first day of walling! Nothing is better than working with stone. All I could think about all day was I LOVE MY JOB!!!. Feels so good to put a wall up in a day, after waiting all winter for this day to come. 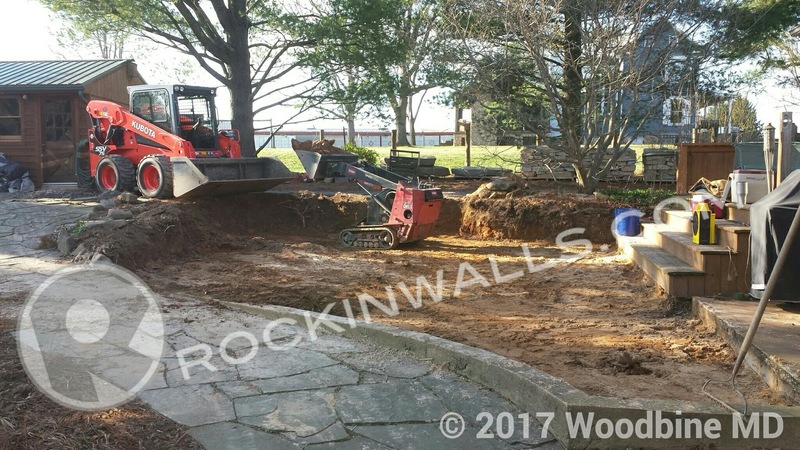 This has been such a great job for me since I'm working with Andy McEvoy on his client's project in Woodbine MD. I rarely have the opportunity to work with other wallers. Andy moved back from Maine with his wife. Andy had worked with a great waller Matt Carter ( DSWA Level 3 ) back in Maine. Andy's client was looking to have a larger flat space and a wheelchair access. 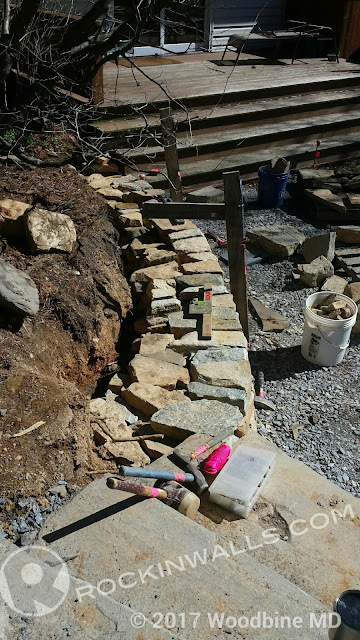 We spent the first 5 days prepping along with building the new updated four PA Colonial Blue stones. Which I feather and wedged according to Andy's direction. Double sided small seating wall. Just a few of the tools used on the job. Strip out of wall along with blue stone patio. Plus 3 truck loads of 8" bedding sand hauled off site. My little Dingo TX420 even had a playmate ( spanking brand new Kubota SLV75) from across the street, come and help for a day. 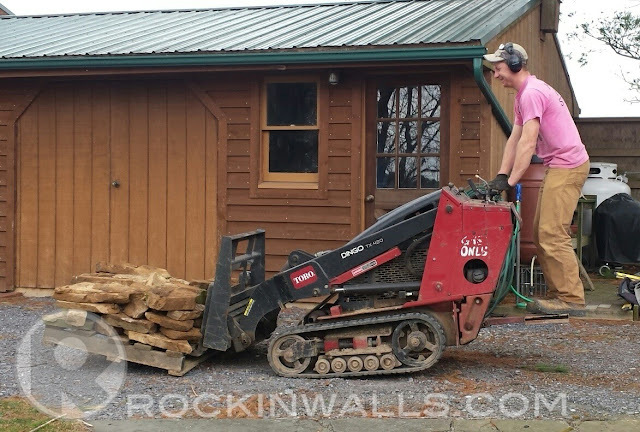 Andy did a stellar job learning how to operate the new hand controls. His ability to adapt is just one of the many skill sets which makes it a true pleasure to work with him. More to come in the weeks to come. 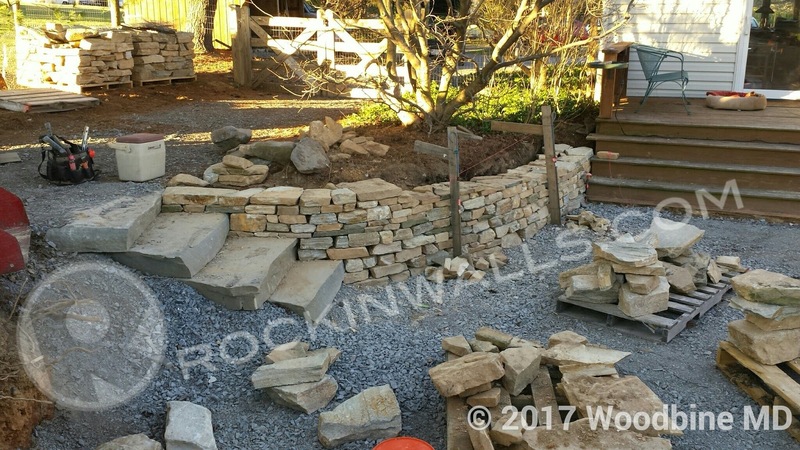 Do you have a Stone Project? 2017 season has just began. Let me help you ........ dream BIG! Nice, Mark. First outside project after hibernation was always awesome!